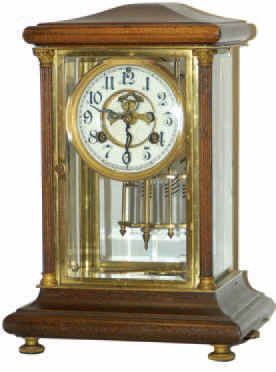 Waterbury Clock Co. crystal regulator, "Vendee", ca 1908. Unusual case for a crystal regulator with polished mahogany top, base, and columns. The doors, bezel, feet, and pendulum, are gold plated. There are four beveled glasses, only one has a tiny corner chip. Overall, this is a good looking, original clock. Two-piece porcelain dial with open escapement, a couple of very light hairlines, a chip around the strike arbor, and on the edge below 6. Imitation mercury pendulum swinging under the 8-day movement. The clock strikes half hours on a hanging gong. Ly- Waterbury No. 459.